Everyone has set the bar high for "Tangled" simply because it is a milestone itself, it being the 50th full length animated offering from Walt Disney Studios. Now that is no easy feat as we all know, Disney has created a lot of classics like "The Lion King", "The Little Mermaid", "Aladdin" and "Beauty and the Beast" - and that's only counting films created the past 3 decades. Adding to the mystic of "Tangled" is the numerous times the title has been changed. Some might call it a marketing strategy but according to Disney executives, they changed the title from "Rapunzel" to "Tangled" so they can also appeal to male audiences. Find out after the jump if we can put Disney’s 50th entry to our top list of Disney films. Princess Rapunzel (Mandy Moore) was kidnapped by an old woman when she was a baby as her magically long hair is able to keep the woman strong and young. She locks Rapunzel up in a tower, pretends to be her mother and never allows her to go out and see the world. Her only dream is to have the chance to see the magical lights up close - the beautiful lights she sees once a year, during her birthday. One day, Rapunzel gets a visit from Flynn Rider (Zachary Levi), a thief who is running away from his pursuers. She makes a deal with him to guide her and take her to the lights and in exchange, Flynn will get back the crown he has stolen. We imagined "Tangled" to be good but it surprised us by shattering our expectations sky high. We didn't expect it to be so superiorly made that it can even level up to a very shortlist of brilliantly animated films. It had the classic Disney tale vibe when it comes to storytelling, with the humor of Disney-Pixar movies. The characters were lovable, including Maximus the horse and Pascal the chameleon (and those characters need not talk to make you laugh). Even Flynn Rider, the thief who is Rapunzel’s Prince Charming was appealing as well. As for the animation, it was superb. At some point, you would be awestruck with the detail. Our favorite was the lantern scene which could probably hold its own and be remembered as one of the most memorable out of a Disney film. "Tangled" definitely brought a whole new heartwarming tale to a classic, they can come up with retelling of Snow White or Sleeping Beauty as well if they are going to be this good! Add to these are the songs, not as brilliant as "Beauty and the Beast" but were very good nonetheless. 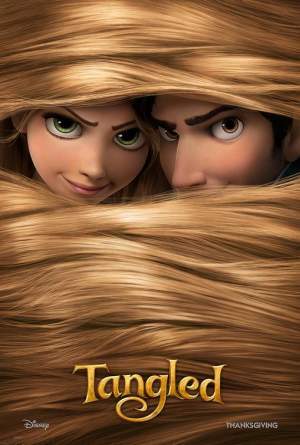 "Tangled" is a heartwarming, extremely funny with a nice hint of action suspense and adventure that everyone would love.